Tamar Energy Community (TEC) – Tavistock and the Tamar Valley. At Regen, we are delighted Kate Royston from Tamar Energy Community (TEC) has been recognised for her dedication to TEC, but also because she has worked diligently over the years to ensure we have a very strong community energy network in South Devon where groups support each other. We’ve also been lucky to work closely with Kate as part of ‘Peer Power’, funded by Power to Change, to widen and make the Devon community energy network more sustainable. 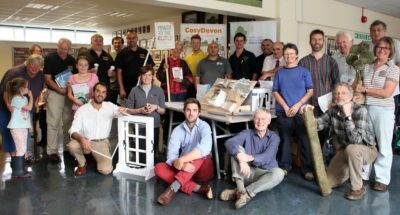 Tamar Energy Community (TEC) is a community benefit society owned and managed by its members, and operating for the benefit of the communities of Tavistock and Callington. They aim to develop renewable energy projects owned by local people that reduce carbon emissions and electricity bills. Installed 320kw of solar PV on six rooftops across the Tamar Valley including local schools, businesses, and Tesco in Callington. This is the supermarket chains first community renewables project. Schools and businesses hosting panels will work closely with TEC to support their ongoing energy advice service through community benefit and local promotion. TEC’s 2016/17 autumn/winter energy advice campaign reached 150+ residents, supporting switching, priority services, heating control use, and people in fuel poverty. Local people can pop into TEC’s ‘Local Matters’ community space to get free independent energy advice or book a home visit. TEC will launch a community share offer shortly to enable increased local ownership. I first visited Easton Energy Group in 2015 and was blown away by their ambition, approach to working in partnership with local businesses, and their exemplary community engagement in a very diverse neighbourhood. There is lots to learn from this team and we have really enjoyed working with them on their TWOS project. Owen Square Community Energy (OSCE) is a non-profit energy supply company in Easton, Bristol, and is a collaboration between Easton Community Centre, Easton Energy Group and community microgrid developer Clean Energy Prospector (CEPRO). 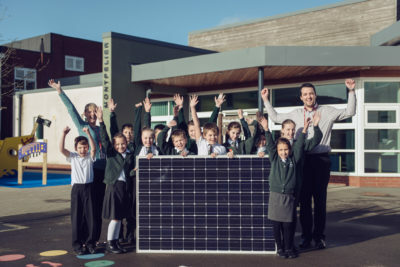 Their project is about retrofitting smart, integrated community solar, heat pumps and storage to reduce net energy imports and carbon emissions for a busy community centre, homes and businesses connected to a single substation in Owen Square park in Bristol. In 2015/16 designed and constructed a hybrid air/ground heat pump energy centre in Owen Square park. They installed a 2km borehole array under this busy urban park and in early 2017 delivered 28.3MWh of clean, renewable electric heat at a variable cost of 2.82p/kWh to the first customer. In summer 2017 the CHOICES system replenished the ground source array with 19.2MWh of air sourced heat costing 1p/kWh reducing cost and grid impact in the coming winter. Two further commercial customers will be connected to the heat network this winter with plans to extend the heat to up to 34 homes. With UCEF/BEIS funding and support from Regen the team has completed a feasibility study into deploying community solar connected with a microgrid to local domestic homes (the TWOS project). The TWOS project will use new trenchless horizontal directional drilling technology to install a physical microgrid that will allow up to 112 homes and a business centre to connect. What Plymouth Energy Community (PEC) has achieved is frankly incredible. 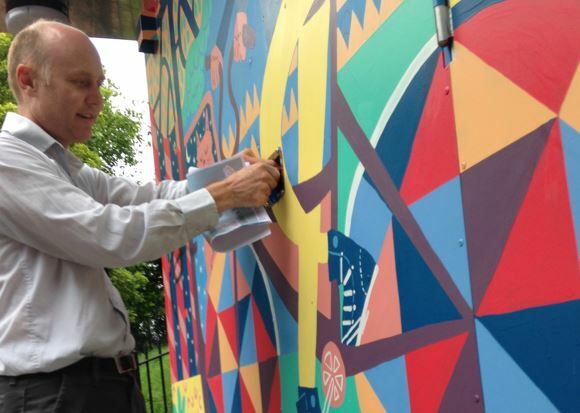 In a city where many people are in poverty, their work makes lives better. They even managed to install a 4.1MW solar farm on contaminated land within the MOD inner blast zone. The PEC team are an inspiration to us all and Alistair MacPherson is a joy to work with, extremely knowledgeable and has been a key figure in driving the energy revolution in a direction that supports communities. Demonstrated what can be achieved when local authorities form partnerships with community energy groups. Balanced the organisations focus between significant renewable generation deployment and high-impact fuel poverty services. Championed the sector across the South-West, UK and beyond.